Arrive in Beijing, the Capital city of China. Be met at the airport and transferred to your hotel. Free at leisure for the rest of the day. Beijing, China’s capital and one of the great travel destinations of the World, offers sights and cultural relics found no where else on Earth. The city has a character all its own; there are quadrangles, small alleys, tricycle, boiled mutton, roasted duck, arts and crafts, Peking Opera, The Great Wall, the 2008 Olympics venue and a vibrancy that is the distinctive flavor of Beijing. Depart from your hotel in the morning to visit Tian’anmen Square, the World’s largest urban square and the Forbidden City, the largest and most complete ancient imperial palace in the world. Then visit the Temple of Heaven in the afternoon. Peking Opera is available for your optional night entertainment. Temple of Heaven As the biggest city center square in the world, Tian’anmen Square covering 44 hectares in the heart of Beijing. It is the place where history-changing events and ceremonies occurred. A few steps away, come to visit the Forbidden City, which was the Imperial Palace for 24 emperors during the Ming and Qing Dynasties and, it is one of the largest, and certainly the most completely restored, ancient architectural complex in the world. Walk in the footsteps of Emperors; come to the museum and see with your eyes, and feel with your hearts; you’ll begin understand what life in this richest of feudal realms was like for the Imperial Rulers, their concubines and their slaves. After enjoying a delicious lunch, continue on to the Temple of Heaven. Departing from the Imperial vermilion and gold hues of the Forbidden City, The Temple of Heaven is decorated in blue, the color of the Heavens. The perfect harmony between the architectural environment and nature can be felt here; you might easily imagine the vivid spectacle of a great sacrifice to the Heavens for a good harvest. The magnificent Hall of Prayer of Good Harvest is one of the most important and impressive building in China. In the evening, we offer you an opportunity to enjoy Peking Opera. Expert performers convey powerful emotions to the audience through song, dance, facial make-up, exquisite masks and costume, skilled use of body language and sympathetically integrated musical accompaniment. In the morning, take a driving for 75km to visit the Great Wall (Badaling Section) first, then Ming Tombs (Changling Tomb), the once lavish burial chambers of 13 emperors of the Ming Dynasty. Peking Roasted Duck is available for your optional dinner. Badaling Great WallJust 75km North-west of Beijing, along a smooth and comfortable highway is the Badaling Great Wall, which is one of the best-preserved and most accessible sections. The Great Wall is an internationally admired structure, symbolic of the cruelty of the ancient rulers, and the stoicism and determination of the Chinese people. The construction of the Great Wall began in the 5th century BC. Then, you will have chance to visit the Ming Tombs which located in the northern suburbs of Beijing. Altogether there are thirteen tombs of Ming Dynasty Emperors from the period after the capital was moved from Nanjing to Beijing. You’ll visit the Changling Tomb, burial site of Emperor Yong Le, the biggest and first built at this historic site. The Lingsi Palace in Changling Tomb’s second yard really deserves a visit. This is unique, a magnificent palace made of camphor wood. The ceiling is colorfully painted and supported by sixteen solid camphor posts. The floor is decorated with gold bricks. For today’s dinner, how about taste the famous Peking Roasted Duck, as it is the best-known dish in Beijing. It is very tender and unforgettably delicious. You’ll visit a local restaurant to enjoy a full meal and learn the proper way to experience Peking Roasted Duck. From the whole roasted duck to the soup of duck bones, you’ll enjoy a banquet made from every part of the duck. Moreover, the chef will demonstrate his skill of cutting the skin of the duck for your entertainment. In the morning, take a relaxing Hutong Tour by rickshaw to visit the ancient lanes and alleyways of Beijing. Be transferred to the airport for the flight to Xian in the afternoon. Our Clients will take the Hutong Tour by rickshaw If exploring the Forbidden City has improved your understanding of the lifestyles of China’s ancient Imperial Court, then this 2 hours Hutong Tour will give you an insight into the lives of ordinary Chinese people and reveal their social culture in today’s Beijing City. The narrow streets of old Beijing are known as Hutongs. You’ll take a pedicab tour along the Hutongs and see the 100-year-old houses, courtyards and a vanishing way of life in today’s Beijing. Enjoy your full day visit to the Qin Terracotta Army, one of the world’s most important archaeological finds, with troops, horses and carriages in battle formation and the massive Xian City Wall. After that, you can take a nice walk to the North Square to view the ancient Big Wild Goose Pagoda. There is also the option to attend fantastic Tang Dynasty Show (dinner included). Xian City WallAs an ancient capital city to 13 dynasties, Xian has a rich recorded history, frequently enhanced by the evidence of new discoveries, like the 1974 unearthing of the fabulous Qin Terracotta Army, the long forgotten army created to guard Emperor Qin Shihuang’s tomb. In accordance with ancient beliefs, this grand project was mounted at enormous cost by the cruel and tyrannical Emperor, only to be attacked, plundered, burnt and buried after his funeral by the peasants who’d labored under the whip to build it. Then, over two thousand years later, this “Eighth Wonder of the World” was rediscovered by farmers digging a well. The fine troops, horses and carriages in battle formation are a National ancient art treasure. Three excavation pits are now opened to the public and a fourth is nearing completion. You can, like US President Clinton, now gaze in wonder upon this historic site, listed by UNESCO in 1987 as a world cultural heritage. The first landmark visitors will encounter in Xian is the ancient City Wall, which stretches round the old city. Xi’an was always a walled city, and today’s wall represents one of the oldest and best preserved Chinese city walls, as well being one of the largest ancient military defensive systems in the world. The first city wall of Chang’an was begun in 194 BCE. The existing wall was started during the Ming Dynasty in 1370; it is massive, measuring 13.7 km in circumference, 12 m in height, and 15–18 m in thickness at the base. The South Gate and North Gate are the two main entrances to the inner city. The city itself is neatly arranged along the city wall. This impressive structure is just a precursor to the remarkable discoveries awaiting visitors to Xi’an. Tang Dynasty Show with Dinner that was created for “emperors only” in ancient China. You’ll enjoy the sumptuous dinner while watching a fabulous dancing and singing performance of the Tang Dynasty. This is not only a performance of Chinese traditional dancing and singing, but a re-enactment of Chinese ancient ceremony and culture. Enjoy your own free time and get ready for your Lhasa tour. You will be then transferred to the airport to board a short flight to Lhasa, capital of the Tibetan Autonomous Region. Lhasa is the capital of Tibet. Located at the foot of Mt. Gephel, Lhasa’s altitude is 3,490 m and the air contains only 68% of oxygen compared to sea level. 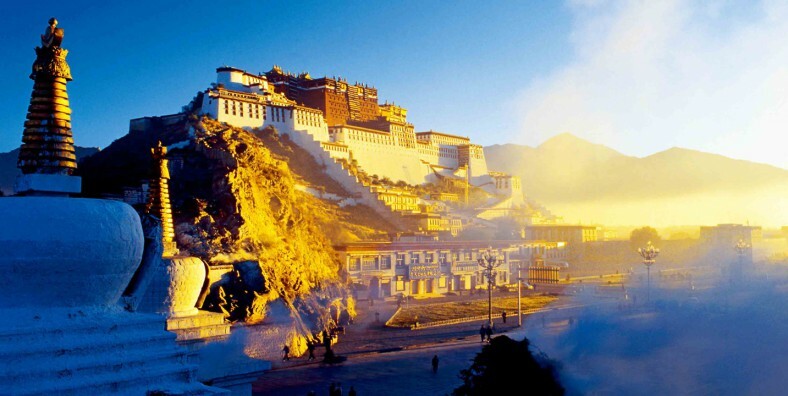 Traditionally, Lhasa is the seat of the Dalai Lama, and the location of the Potala Palace and Norbulingka Palace. In Tibetan Buddhism the Jokhang Temple in Lhasa is regarded as the holiest centre in Tibet. Taking a visit to Lhasa, a trip to Potala Palace is a must. It’s the largest monastery of its type in the world and official home to Dalai Lama. Then move to Jokhang Monastery, where monks receive their official training and education. The surrounding Jokhang Monastery of is Barkhor Street. Walk along this street of eight corners which will afford us a window into Tibetan culture and an opportunity to buy colorful ethnic handicrafts rarely seen outside of Tibet. When you enter into a temple or monastery in Tibet, please take off your hats at the entrance to show your respects and follow the clockwise direction for visiting. No smoking, do not touch the Buddha statues, turn the Buddhism scriptures or toll the bell. Jokhang MonasteryThe awe-inspiring Potala Palace, perched high above much of Lhasa, is the landmark of the city. The palace which consists of the Red Palace, the White Palace and some attached buildings was a complex of political and religious function. Now it is a huge treasure house for materials and articles of Tibetan history, religion, culture and arts. Located at the center of the old Lhasa, Jokhang Temple is the spiritual center of Tibet. Built in 647 by Songtsen Gampo, it has a history of more than 1,300 years. The temple is the fine product of Han, Tibetan and Nepalese architecture techniques. Visitors will be treated to the sight of various exotic and sacred sculptures. Jokhang Temple also houses many invaluable cultural relics. Every year, the Great Prayer Festival is held here. Then explore Barkhor Street. It is a famous commercial and commodity-distributing center in Lhasa, consisting of more than 120 handicrafts shops and more than 200 stalls. It is a good choice that should never be missed by tourists coming to Lhasa, for you can buy anything Tibet-related, from sacks of incense, chunks of yak butter to monk outfits. Barkhor is the road that pilgrims tramped out around Jokhang Temple through centuries. When walking along Barkhor Street, you should move in the clockwise direction. After breakfast, enjoy your sightseeing tour today that starts with a visit to Drepung Monastery, then continue your tour to Norbulingka and Sera Monastery. Sera MonasteryLocated 5 km from Lhasa, the Drepung Monastery is considered one of the three great monasteries in Tibet. It was first built in 1416, and held 7,700 monks in its heyday. In Tibetan language, Drepung Monastery means monastery of collecting rice. Norbulingka means Jewel Garden. First built in 1751, it borrowed architectural style from the inland areas of China while maintaining local ethnic and religious features. Norbulingka served as a traditional summer palace and residence starting with the 7th Dalai Lama, and now it is the largest garden in Tibet. In the afternoon, the Sera Monastery will be a good choice as well. It is the last of the three principal Yellow Sect monasteries built in Lhasa. The setting itself is very beautiful with cobbled alleyways, temples and colleges. The highlight of visiting Sera Monastery will be watching monks debating inside the shady courtyard behind the main temple. Every day, hundreds of red-robed monks assemble in small groups and practice their debating skills. In the morning, take about 4hours driving to Shangri-la, the legendary lost paradise, a place with stunning scenery, the azure sky and the hospitality of unsophisticated people. On arrival, take a visit to Dukezong Ancient Town. Dukezong Ancient TownShangri-la is a primarily Tibetan county in northwestern Yunnan and the capital of Diqing Tibetan Autonomous Prefecture. The county was formerly called Zhongdian but in 2001 was renamed after the fictional land of Shangri-La, from the James Hilton novel Lost Horizon. With many miles of beautiful vistas to discover, this region offers unique hiking and horse trekking opportunities to those who make the journey down to Northern Yunnan. At an altitude of 3,200 meters, Shangri-La is the start point of the Tibetan world in Northern Yunnan. The small town once was the frontier trading post on the doorstep of Tibet. Dukezong Ancient Town, at the southeast corner of Shangri-La, offers sanctuary to all those seeking refuge from the cares of city life. Its authentic Tibetan dwellings, gilded prayer halls and pagodas, and lanterns of various shapes lighting the way along narrow, winding lanes are permeated with the grace and mystique of antiquity that enchants visitors the moment they set foot in. Dukezong means the town of moonlight in Tibetan language. With a history of over 1350 years, it has experienced both the flames of war and prosperity of frontier trade as a key stop on the Ancient Tea-Horse Trail and a focal point for Han-Tibetan exchanges. Pataso National ParkNot far from Shangri-la, Songzanlin Lamasery is the largest Tibetan Buddhist lamasery in Yunnan, and one of the 13 large lamaseries in the joint area of Tibet, Yunnan and Sichuan. Constructed in 1679, it took about three years to complete. Built against the mountain with a magnificent appearance, Songzanlin is a faithful imitation of the Potala Palace in Lhasa Tibet. The most famous treasures in the lamasery are the eight gold-covered sculptures of Sakyamuni, bronze sculptures, the Ganzur scriptures hand-written in liquid gold, gold lamps, and many exquisite gilded silver incense burners. Potaso National Park is located 22km away from Shangri-La, about half an hour’s driving. As China’s first national park, it mainly consists of two lakes- Shudu and Bita, the distance between takes about half an hour’s driving by green van. In the morning, take another 4hours driving, you will reach Lijiang, and visit Lijiang Ancient Town to walk down the cobblestone streets over 700 years and see the Naxi way of life which chaned little over time. Lijiang Ancient TownLijiang Ancient Town is well-preserved and known as a centre for the Naxi people’s brilliant culture. With a history of more than 800 years, the town was built in the interval as the Song Dynasty changed to the Yuan Dynasty, and occupies an area of 3.8 square kilometers. It is built along the lie of mountains and the flow of rivers with the ancient water-supply system which is still in use today, providing a precious example for research on ancient architecture. As a result of selective adoption of ideas from other cultures by the Naxi group, the buildings in town incorporate the best of the architectural styles of Han, Bai and Tibetan, developed into the unique Naxi style. The layout of the town is free and flexible, the houses are close and diverse and the lanes are narrow and meandering. Along both sides of the lanes, there are shops selling superb handicrafts. Here you also have the chance to trace the ancient Tea-Horse Road. In the morning drive about half an hour to visit Jade Dragon Snow Mountain (cable car and green vans available in the scenic area). After lunch, visit Yufeng Temple and Baisha Mural in the ancient capital of Naxi Kingdom in Baisha village. Jade Dragon Sown Mountain Jade Dragon Snow Mountain nestles near Lijiang. It is the southernmost glacier in the Northern Hemisphere, consisting of 13 peaks with the highest one, Shanzidou, at an altitude of 5,600 meters. Looking from the town, the mountain resembles a jade dragon laying in the clouds, hence the name. The view of the massif from the gardens at the Black Dragon Pool in Lijiang is noted as one of China’s finest views. Built in 1756, Yufeng Temple is located at the southern foot of the Jade Dragon Snow Mountain, 13km from Lijiang. The temple is surrounded by a verdant forest and river with the snow mountain at its back. It displays a harmonious mix of architectural styles of Han Buddhism, Tibetan Buddhism, Taoism and local Naxi Dongba Religion. It is witness to the peaceful coexistence of multinational cultures and religions. It still plays an important role in local residents’ religious life. Baisha Mural is located at Baisha Villages, 10km north of Lijiang. Although the traditional houses do not look impressive, this was the cradle of the Naxi culture and ancient capital of the Naxi Kingdom. The valuable murals are protected inside Dabaoji Palace and the colored glaze temples. The originality and figures within the murals reflect the different religious cultures and artistic forms of Buddhism, Lamaism, Taoism and local Naxi Dongba religion’s development into Naxi School. Each painting includes at least one hundred portraits, which are not only Buddha, but also ordinary people such as bureaucrats, farmers, citizens and even criminals. Many of the scenes and subjects are drawn from people’s daily life showing fishing, riding horses, weaving, dancing and casting iron. In the morning, you will be transferred to Dali, the ancient political, economic and cultural center of Yunnan area. Upon arrival, visit Dali Ancient Town and Three Pagodas, the symbol of the history of Dali. Dali Ancient TownDali is located on a fertile plateau between the Cangshan Mountains to the West and Erhai Lake to the East. It has traditionally been settled by the Bai and Yi minorities. Dali is the ancient capital of both the Bai kingdom Nanzhao, which flourished in the area during the 8th and 9th centuries. Dali Ancient Town is 13km (8 miles) away from Dali City. The city’s history can be traced back to the early Ming Dynasty (1368-1644). According to ancient literature, the City was a gateway to the ancient Silk Road in Southwestern China. Because of its history and wealth, Dali Ancient city was surrounded by the wall which is over 6km in length, 7.5 meters high and 6 meters thick. In 1982, the northern and southern city wall towers were rebuilt to offer visitors a glimpse into the ancient wall’s grandeur. The architecture of Dali Ancient City is in the traditional Bai ethnic style and gives the city a very distinct feel. Dali Ancient City is well known for its traditional arts and crafts. It is particularly famous for its marble and hand woven handicrafts. With a history over 1,800 years, the Three Pagodas is the symbol of Dali, and the witness of the development of Buddhism in the area. The Three Pagodas are at the East foot of the tenth peak of Cangshan Mountains and face the West shore of the Erhai Lake of the ancient Dali Town. They are an ensemble of three independent pagodas arranged on the corners of an equilateral triangle, with the main pagoda 69 meters in height. Three Pagodas together with Zhaozhou Bridge in Hebei Province and Great Wild Goose Pagoda in Xi’an are known as the three curiosities of Chinese ancient architecture. Today, after breakfast, you will first be transferred to the pier and take an Erhai Cruise for about 4hours. Then in the afternoon, then visit Xizhou Bai’s Houses (Yan’s Courtyard included) where you can see what the Bai people’s houses like. Erhai LakeErhai Lake is the second largest lake in Yunnan after Dianchi Lake, and one of the seven biggest fresh water lakes in China. On sunny days, the crystal water of the lake and the snow mantled Cangshan Mountain create a beautiful scene described as silver Cangshan and jade Erhai. The surrounding isles, temples and villages of Erhai Lake are also worth visiting. The Golden Shuttle Island and the nearby fishing community of Bai people with Bai’s culture and lifestyle are charming attractions. You can also enjoy the Three Courses Tea of Bai people on the isles. You will regret it if you miss Xizhou Bai’s Houses 18km north of Dali. Green mountains, winding creeks and fertile land make life here lyrical and carefree. The history of Xizhou dates back to the Sui Dynasty (581-618AD). People nowadays regard Xizhou as a town famous for the Bai culture. The old houses and streets are well preserved and visitors may still find traces of past glory. The houses of are characterized by a traditional Chinese rectangular courtyard with a screen wall facing the gate. On the screen wall usually are four Chinese characters reading ‘Qingbai Shijia’ (innocent family) or ‘Ziqi Donglai’ (Auspicious air comes from the East). Around them are landscape paintings and decorations with colors in profusion. The doors and windows are full of grills with auspicious paintings. Fly back to Kunming in the morning, you will then take a visit of Western Hill & Dragon Gate. After the tour, you can have a short visit to Village of Ethnic Culture. Western Hill & Dragon GateWestern Hills lies in the Biji Mountain chain to the west of Kunming. It is visible from the eastern or northern banks of Dianchi Lake. Clouds and mist often hide the mountain sides, with their giant firs and pines and many ancient temples. The Dragon Gate in the Western Hills is close to the west shore of the Dianchi Lake. The elevation of the Dragon Gate is over 2,300 meters, 300 meters higher than the water surface of the Dianchi Lake. It consists of the Sanqing Temple and the Dragon Gate Grotto which was accomplished through 72 years of hard work (1781-1853). The 3 March is a festive time in the Western Hills, when it is considered the best time for Kunming residents to climb the mountains and look into the distance, to admire the spring flowers and appreciate the feeling of new life. On the bank of Dianchi Lake to the southwest of Kunming, the Village of Ethnic Culture is a window to show the cultures and customs of various ethnic groups of Yunnan. In the morning, you will be transferred to the airport for your short flight to Guilin. On arrival, you will be met at the airport and transferred to your hotel. Actually, during your way to the hotel, you can have a short stop at Reed Flute Cave, a fantastic Karst cave with a profusion of stalactites and stalagmites, stele, stone pillars, stone curtains and stone flowers. Reed Flute Cave Guilin is world-famous for its serene landscape, Karst limestone formations, mist-covered hills and bamboo groves. It is home to more than ten ethnic groups, including Han, Zhuang, Miao, Yao, Hui and Dong. On the way from the airport to your hotel, you will see dozens of pretty hills everywhere in the city of Guilin. It is a city of hills and green trees and boasts one of the most photographed areas of China. Reed Flute Cave is named for the special reeds, used for making flute instruments that grow near the cave entrance. The caves are a feast for the eyes. The natural beauty of a profusion of stalactites and stalagmites, stele, stone pillars, stone curtains and stone flowers creating an infinite variety of extraordinary scenes, creatively illuminated, is bound to evoke gasps of admiration. It is fitting then, that Reed Flute Cave is commonly praised as Nature’s Grand Art Palace. In the morning, you will take about 2.5hours driving to Longsheng, for your today’s highlight tour to Longji Rice Terrace and Ping’an Zhuang Village. Be transferred back to Guilin after the visits. Longji Rice TerracesLongji Rice Terraces are reached from Guilin by mountain roads amid spectacular scenery. With a history of more than 700 years, the area is still being used for growing premium quality rice by Yao and Zhuang villagers. The rice terraces are built into the hillsides and look like great steps cut into the slopes as they wind around the mountainsides. This ingenious construction makes best use of the scarce arable land and water resources in the mountainous area. The Rice Terraces are much prettier after the rain, as the morning fog is clearing or while rice is being harvested. If you like to paint or photograph dramatic, beautiful landscapes, this would be a superb destination in which to practice your art; or come here anyway just to look, gaze in awe, and take it all in; it’s a Guilin must-see! Ping’an Village is a Zhuang minority village high up in the mountains at Longji. The village is only accessible by foot, and from across the valley, the visitor has a first impression of entering another land as the buildings, clustered around the hillside, are all two story wooden structures resembling a European Alpine village. This is the traditional Zhuang style house and among them there are excellent guest houses that can cater to all your practical needs. Ping’an is surrounded by beautiful terraced rice fields. From a distance, the terraces look like contour lines on a topographical map, texturing the ridges, mountainsides and valleys. It is a charming environment that will have the most demanding photographer constantly busy and wearing a slightly demented grin. In the morning you will be driven to the Pier for the Li River Cruise (about 4 hours, lunch served on board). Savour the fairy-tale scenery while cruising down the meandering river to Yangshuo. After disembarkation, have a walk along the famous West Street. In the evening you can enjoy the optional night show of Impression of Liu Sanjie. Li River CruiseIn the morning, be driven to Pier for your Li River Cruise. A double-decker river boat is waiting for you. The landscape from Guilin to Yangshuo is truly a masterpiece of nature. The crystal waters, straight-out-of-a-painting mountains, peaceful farm fields, hard-working-but- ever-smiling fishermen and wandering water buffaloes inspire poetic musings of Guilin’s charming life. Under the blue sky, your river boat transports you in an unending daydream. You will end up your cruise in Yangshuo, is a small oriental but Western-influenced town with a history of 1000 years. The West Street in the town earns its name since almost every one in West Street can speak fluent English and every restaurant or bar offers menus in several languages. You’ll feel no borders or distance here and will soon fall under the spell of this charismatic, welcoming small-town atmosphere. Moreover, West Street is flanked by fascinating little shops and vendor stands selling a broad variety of superior quality souvenirs, perfect gifts for friends and relatives. West Streets charms increase when night comes; countless bars, cafés and bistros open till midnight with dynamic music and live bands to ensure you can have a really memorable night with your new-found friends. Some guests may also hear about the night show- Impressions of Liu Sanjie performance. The site is only one mile from West Street in the world’s largest natural theatre which utilizes the waters of the Li River as its stage, flanked by twelve mist shrouded hills and the heavens as its backdrop. Mist, rain, moonlight, the hills and their inverted reflections in the river all become the ever-changing natural background, so you will enjoy a unique experience each time you attend. In the ‘Impressions of Liu Sanjie’, you will be presented with stylized scenes and events from the daily life of the Zhuang people living around the Li River. From these pageants, you will gain a realistic sense of Sanjie’s birthplace and appreciate the beauty of the folk songs. If you are able to take photographs under low-light conditions, you are assured of some stunning images from this performance. In the morning, have an excursion (if you are interested, can have a biking) in the countryside of Yangshuo to admire some of the most stunning scenery like the Moon Hill and the Big Banyan Tree. Drive back to Guilin after lunch for your flight to Shanghai. Big Banyan TreeFrom Yangshuo, it is a short, pleasant drive to the aptly named Moon Hill, a great limestone peak with a naturally created moon-shaped cavern passing through just below its summit. If you get up to the top, you will find the landscape is stunning viewed from the very top; the skyline is lined with peaks of almost equal height – resembling a jumble of giant rock traffic-cones pointing skywards. The Big Banyan Tree is said to have a history of nearly 1, 400 years and has survived centuries of wind and rain. The Big Banyan Tree is now 17 meters high, 7.1 meters around the main trunk, and spans an area of 1000 square meters. As a major tourist attraction, the enormous Banyan is famous for its age and towering beauty. It is also noted because the Chinese film ‘The legend of Liu Sanjie’ was partly shot here. The beautiful love story adds to the magic of this centuries-old tree. Shanghai is a city unlike any other in China. It is the bustling economic heartbeat of China that enjoys all of the comforts and amenities of a fully modern metropolis. Shanghai today looks to regain its former position at the turn of 20th of being one of the largest financial centers in the world behind New York and London. It is a city that seamlessly blends East and West. Today, enjoy your full day city tour that start with the visit to the Yuyuan Garden, a Chinese classic garden in city downtown, and the nearby old street. Next have a bird-eye view of the city after ascending Shanghai’s new landmark- Shanghai World Financial Center in the new and fast-developing Lujiazui. After that, have a short stop at Shanghai Museum. In the late afternoon, have a nice walk along the Bund, Shanghai’s famed waterfront promenade, will be a good idea. Today if you are interested you can take an Acrobatics show as the optional activity. Collection of Shanghai Museum Yuyuan Garden has a lot of stories for it was severely damaged in the 19th century and was restored in 1961. This garden was first built in the 16th century by provincial governor, Pan Yunduan, in honor of his father who was the then government minister. It has many scenic courtyards decorated with baroque rockery, pools, and flora that are all connected by corridors and passageways. The delicate design and exquisite layout of the whole garden reveals a strong impression of ‘garden in the garden, whole in the part. Shanghai World Financial Center is a super tall skyscraper in Pudong New Area, Shanghai. It is a mixed use skyscraper which consists of offices, hotels, conference rooms, observation decks, and shopping malls on the ground floors. On 14 September 2007 the skyscraper was topped out at 492.0 meters (1,614.2 feet) and became the second tallest building in the world; as well as the tallest structure on mainland China, including Hong Kong. Shanghai Museum is a large museum of ancient Chinese art. Founded and first open to the public in 1952 and then moved into the former Zhonghui Building in Henan Road in 1959. In 1992, the Shanghai municipal government allocated to the museum a piece of land at the very center of the city, the People’s Square, as its new site. This magnificent new Shanghai Museum was open in its entirety to public in 1996, with eleven galleries and three exhibition halls in a space of over 10,000 square meters. With bronze ware, ceramics, and painting and calligraphy as its distinctive collections, the museum boasts 120,000 pieces of rare and precious cultural relics in 21 categories. Then it comes to the Bund, the showcase with the old buildings of colonial-era leftover along Huangpu River. The renowned waterfront district is the city’s most famous landmark. The word BUND is of Anglo-India origin meaning embankment on the waterfront. It is also the popular site to enjoy the night view of the city. Shanghai offers colorful recreations with rich contents and creative form. Your night may be filled with an interactive old form of art known as the Acrobatics. Those professional performers have been trained of as early as age six or seven so that they can play so well and excellent. It definitely will be an unforgettable night in your memory. Your China Experience is over all too soon as you transfer to the airport and board the homebound international flight, bidding a fond farewell to this ancient land.